A late recap is better than none. Winning should have been better on Sunday when the Sharks lost to Karlskoga. “I want this one back,” bench coach Joel Earnest says. The tough task of facing Karlskoga(/Sölvesborg) was not made easier when Göteborg Hajarna (3-3) made the trip with basically nine players. Sure, the lineup card had eleven names scribbled down but Joel Earnest was basically there as a bench coach and this reporter should probably not have been there at all. José Martinez (1-2) got the nod from the interim manager since skipper Jonny Edgren was absent and Martinez fought admirably. Going up against former national team pitcher Kent Karlsson, Martinez held his own and battled the heat, his own arm and some questionable calls. Karlskoga took an early lead after the Sharks made some defensive mistakes and went up 2-0 in the bottom of the first. Martinez kept on fighting but was erratic on occasion and walked a whooping five batters, which is not at all like the Sharks ace. Martinez was also robbed of two runs when José Muñoz made a great catch at shortstop only to not get the call from the umpire. That catch would have been the third out and the end to a scoreless bottom half of the fourth inning with the Sharks on top 6-5. 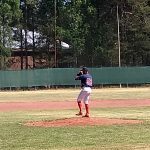 Instead, the Karlskoga Bats (6-1) went on to score two runs for the lead before the Sharks could get the fourth out of the inning. Martinez fought to no avail. The Sharks did fight back thanks in part to an inside the park home run from Muñoz and the second coming of Johan ‘Wheels’ Weidolf and went in to the bottom of the 7th with a 9-7 lead. After a run scored for the Bats, the Sharks turned a double play to get the last out and end the first game with a W.
No. That’s not what went down at all. It really should have ended there, but the close play at first was called safe, the inning continued and and the Bats could get away with the win in the first game with a score of 10-9. Martinez did go the distance and was charged with the loss. He ended up giving up the ten runs on ten hits and the five walks while adding eight punchouts. 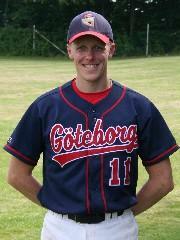 Offensively, the Shark that really stood out was Weidolf who went 4-4 with a double and four runs batted in. “I’m seeing the ball really well. Plus, I like winning better than losing,” Weidolf says. Weidolf is playing like it is 1999. With Shervin Shakki on the DL, Erik Earnest (1-1) took the mound for game two and pitched well. While he only struck out two in his 4.1 innings of work, he also only walked one and kept the game pretty close. Unfortunately for Earnest, this reporter decided to put himself in right field to start the game. In doing so, he committed two errors (although the official scorer did not score them) and looked awfully silly at the plate. Thankfully, he took himself out after the second at bat. Things unravelled with those errors and some good batting from the Bats as they took a 7-1 lead after scoring five runs in the fifth. Chu Li Heng relieved Earnest and did not have his best stuff this day as he gave up three runs in the fifth and sixth inning over one inning of work. 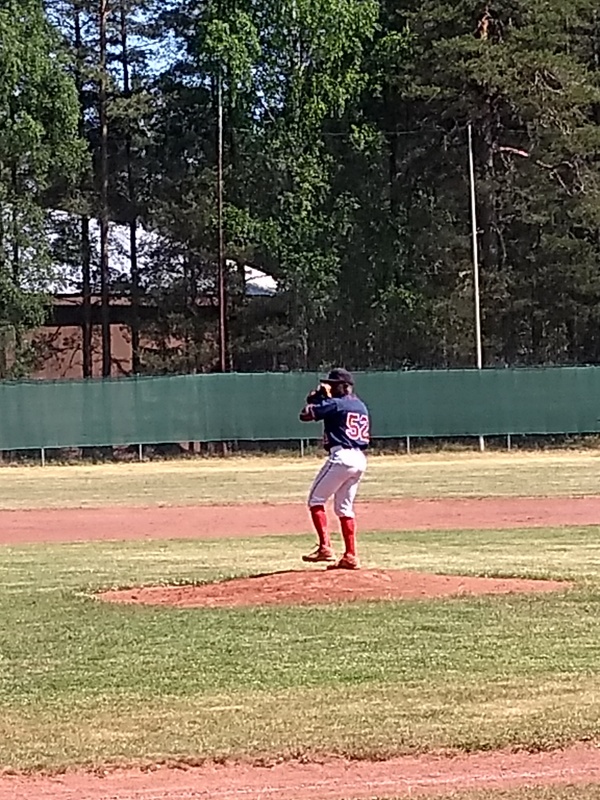 After some discussion, Mokhlad al-Ghanimi made his 2018 debut on the mound in the seventh inning and started off with trowing twelve straight balls. After that, he did settle down and allowed one run while striking out two in his 0.2 innings of work. Sadly, this game was pretty much lost as the Sharks could not get to Bats/Firehawks starter Anton Calson. Neither, it should be said, could they get to the Karlskoga/Sölvesborg pitcher Samuel Siddall who was overpowering the Sharks hitters in relief. Weidolf kept on raking in the 7th and hit a triple to knock in three runs to make the final score 10-4. “That first game eluded us. We definitely deserved to win that,” the interim manager said before denouncing himself of any future coaching duties. Next, the Sharks play Tranås on Sunday June 10th in their home opener. First pitch at 12. Weidolf is hitting is hitting .800 on the season. With a .1879 OPS. Hello. Muñoz and Eric Marquez is a pretty good double play combo. Karlskoga/Sölvesborg will probably promote to the Elitserien this season. This entry was posted in Gothenburg Sharks on June 8, 2018 by alex.